We were delighted to have received a personal thank you card this week from Naomi and Monti’s wedding at Warbrook House back in September 2013. It looks like the bride, groom and guests enjoyed the jazz band! 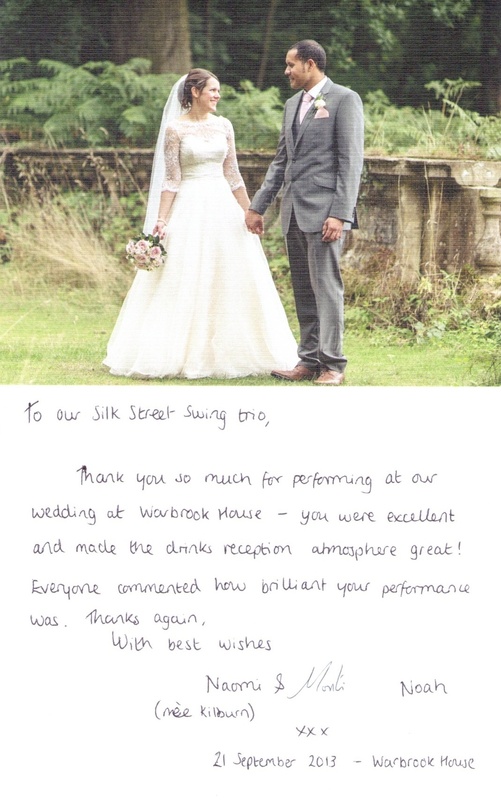 Considering Silk Street Swing for your wedding celebrations? It’s easy to contact us by phone or email to make an enquiry and discuss your unique requirements for your Wedding reception. Give us a call today on 0800 756 5512 to discuss your Wedding reception jazz music.